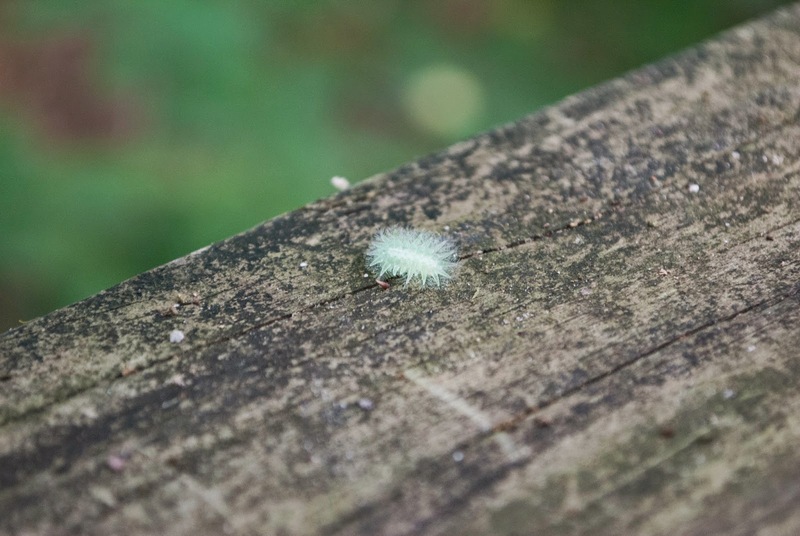 I saw the caterpillar on the wooden walkway that leads to the River Styx, pictured here -- it's one of many cool local attractions at Mammoth Cave Park. 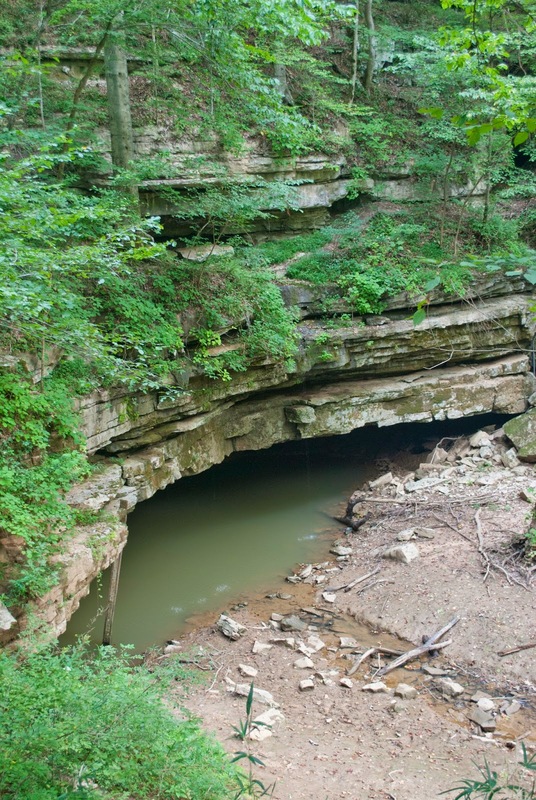 Mammoth Cave is also the least crowded National Park I have ever visited. The caterpillar looked like this when I first saw it. I'll bet it had fallen from a tree above. I would never have noticed it if it had landed anywhere but on the contrasting wooden railing of the walkway. The caterpillar is tiny, only about 1/4 of an inch long. Congratulations spun glass caterpillar -- you are my 2014 creature of the Year! Yay! 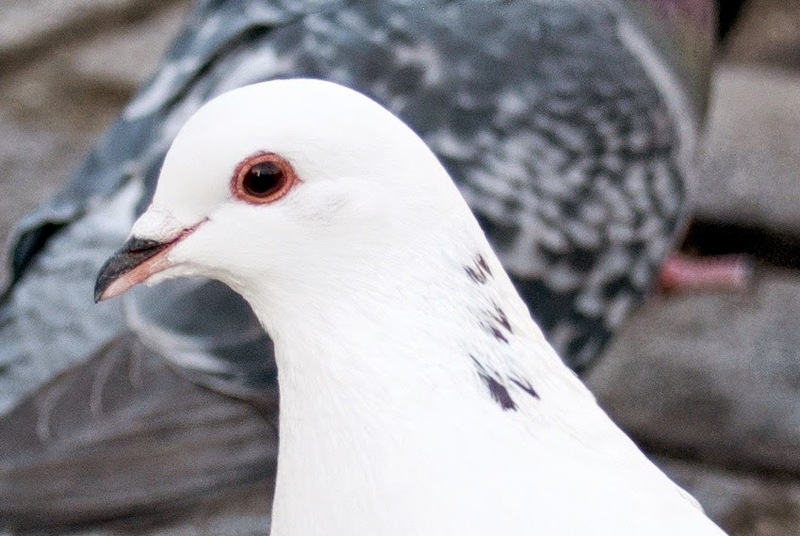 There is big news in the bird world this week. 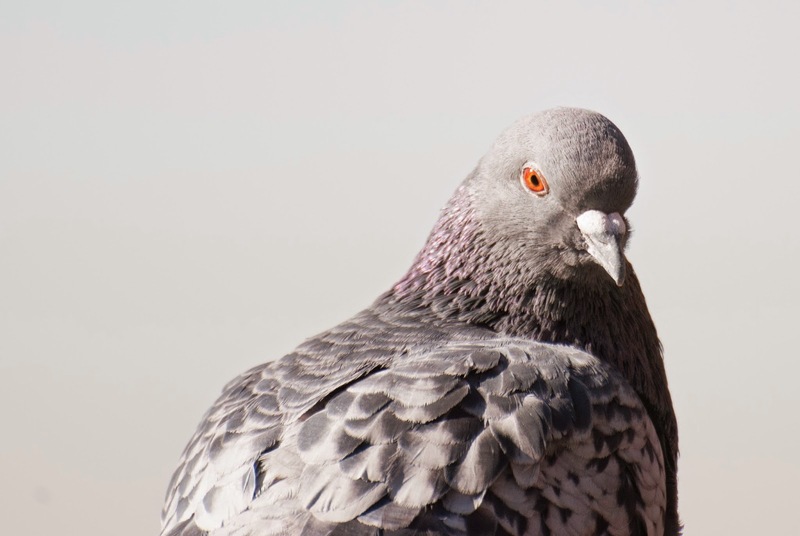 For the last four years, hundreds of scientists in an international group called the Avian Phylogenomics Consortium have been sequencing bird genomes. 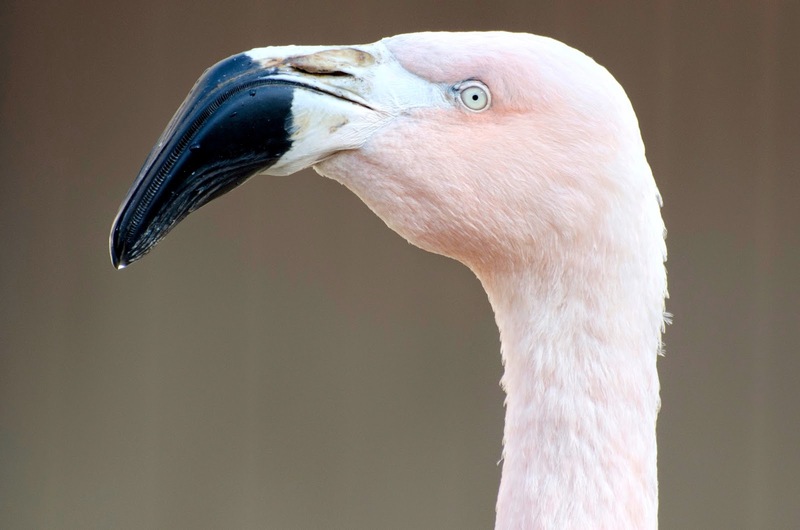 They sequenced the DNA of 45 extant birds and a few crocodilians, and combined that with three previously sequenced bird genomes and then analyzed that huge mass of data. The results just released show the best reconstruction of the evolutionary relationships among the orders of birds that we have so far. 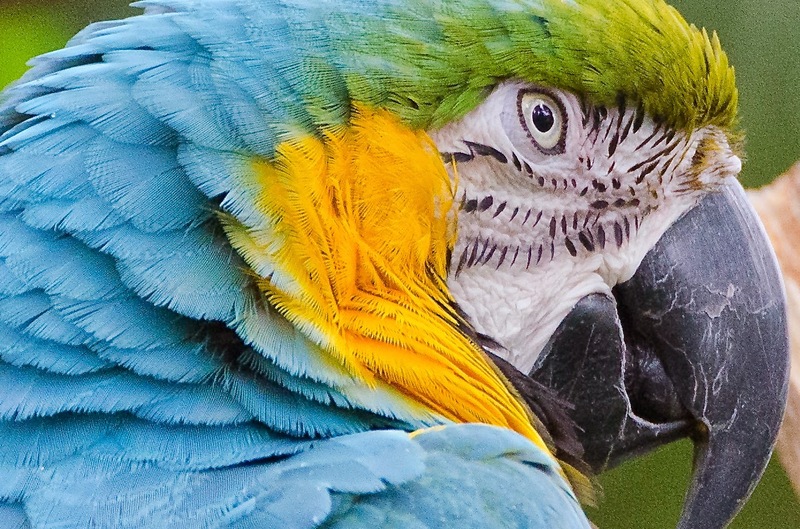 And there is lots to marvel at: falcons are more closely related to parrots than to eagles and vultures, and flamingos are a sister group to grebes. To look at the tree of relationships, click here. The results of the study were published in a special issue of Science Magazine; eight research articles from the study can be accessed by clicking here. 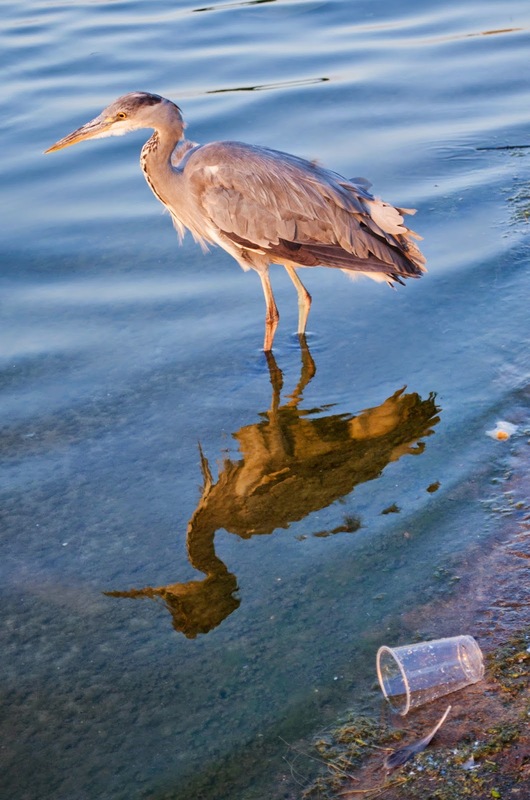 Another 20 papers were published elsewhere; read them on the Avian Phylogenomics Project website by clicking here. 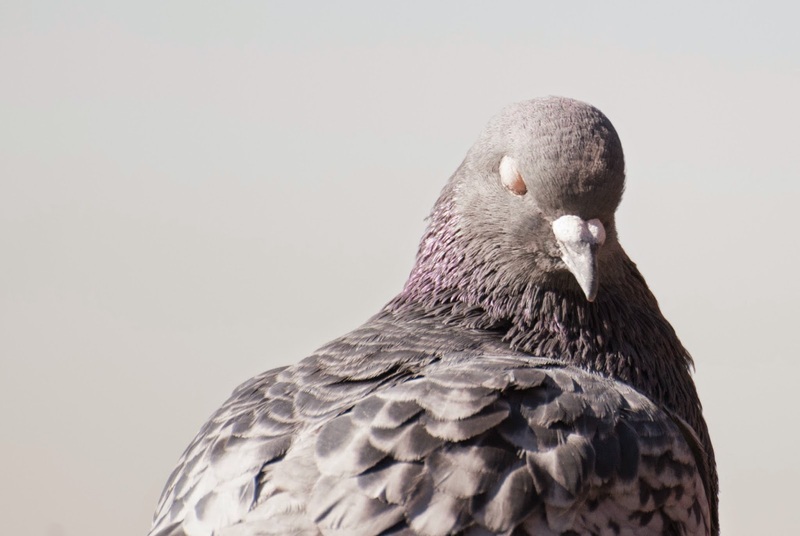 Some of the high points revealed by the study are that bird genomes are near a third of the size of mammal genomes, and lack gene clusters present in many other vertebrates. 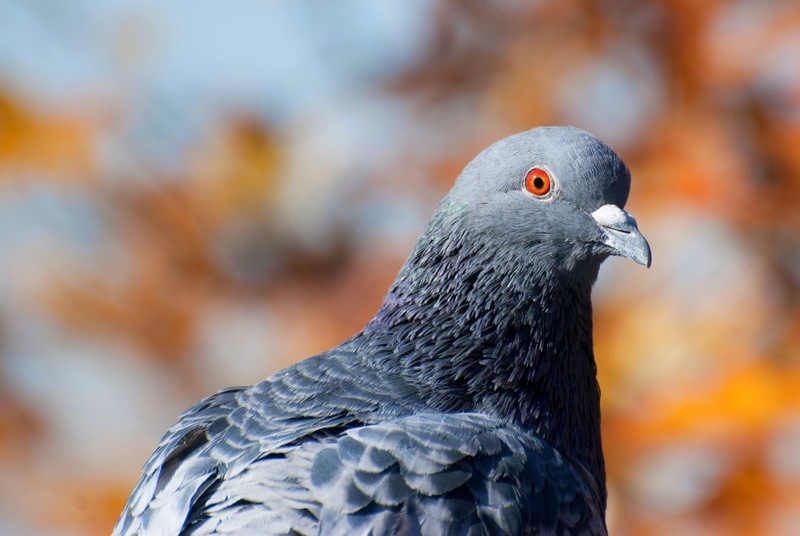 There are analogies between vocal learning genes in birds and humans. Coolest, and possibly explaining the house sparrows' attitude issues, the ancestor of all land birds, including giant monster sized "terror" birds now extinct, was probably a big predatory bird. An even older ancestor lost the genetic code for growing teeth. This study produced data that will be mined for years to come. Remember the polar vortex winter we had last year? This robin came to my window every cold morning of it with his feathers so puffed up he looked downright chubby. I fed him raisins for breakfast straight through until spring. He's back! He (or someone who looks just like him) started looking in my windows a few weeks ago and is back in the habit of breakfasting on raisins at my place. Robins eat worms and insects and fresh fruits and berries when they can get them. We typically see robins stalking worms in short grass all through summer. When winter comes and the insects and worms hole up, robins change to a diet primarily of dried fruit. 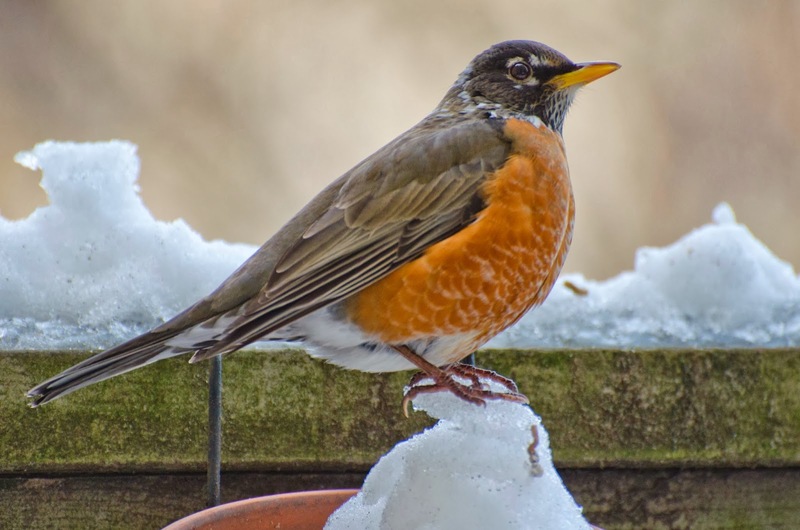 Some robins migrate to warmer places, but some just disappear from lawns and form winter flocks that travel to different kinds of foraging areas. White-throated sparrows are behaving differently in deference to winter, too. They have started to show up on my porch where I haven't seen them since last winter. 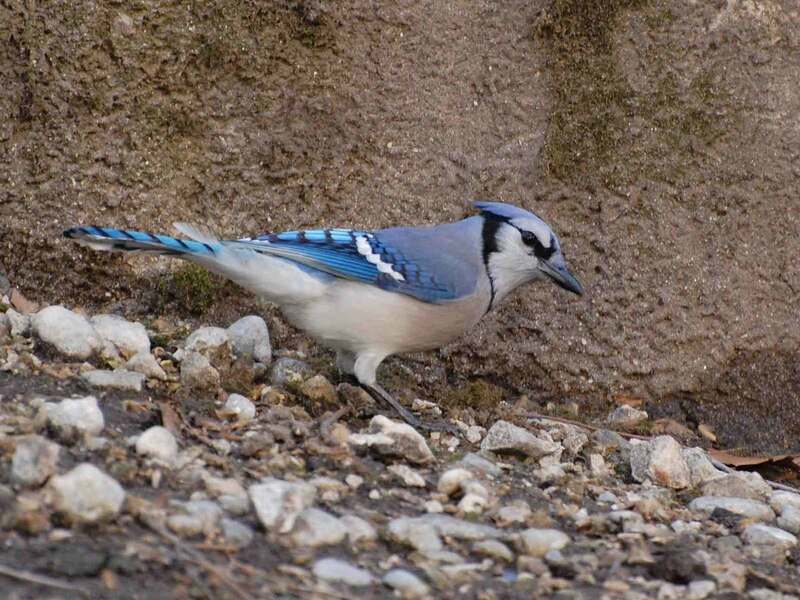 I see them in the neighborhood all year, but they only visit the porch in winter (even though they would likely find a snack of seeds in any season). Click to enlarge. New York City's northern mockingbirds tend to stay put during the winter, but it might seem like they have gone south. We are used to their flashy wing-waving and tireless singing; in winter they become relatively quiet. They visit my porch for raisins. As the Thanksgiving festivities draw to a close, consider the wild turkeys of New Jersey, a few of which are pictured above. Wild turkeys had been extirpated in New Jersey by the mid-1800s. 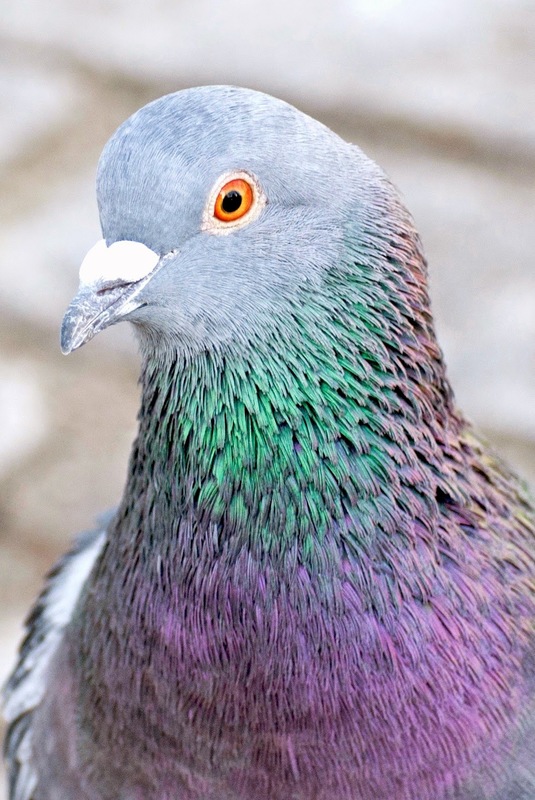 In the 1970s a few birds were reintroduced. That population caught on, and wildlife managers captured and released them more broadly around the state. Now, about 40 years later, turkeys are a common sight all over New Jersey. Too common a sight, some say; there are thought to be about 23,000 of them out there! Click to enlarge. This looks like a lovely autumn lake in the country, doesn't it? Nope. 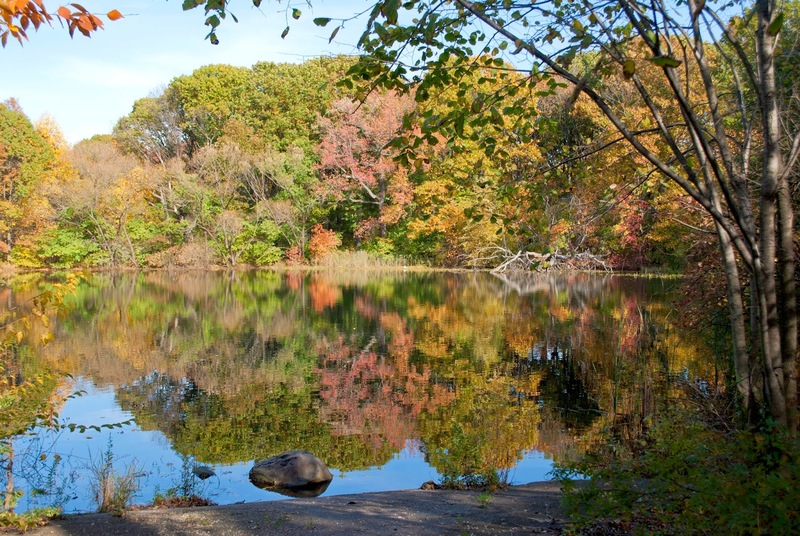 It is in Prospect Park in Brooklyn -- about as urban as a place can be. The designers did a great job of creating an illusion of remoteness, didn't they? There's no population of wild turkeys here yet, but you can see one big old male wild turkey in the Prospect Park Zoo. 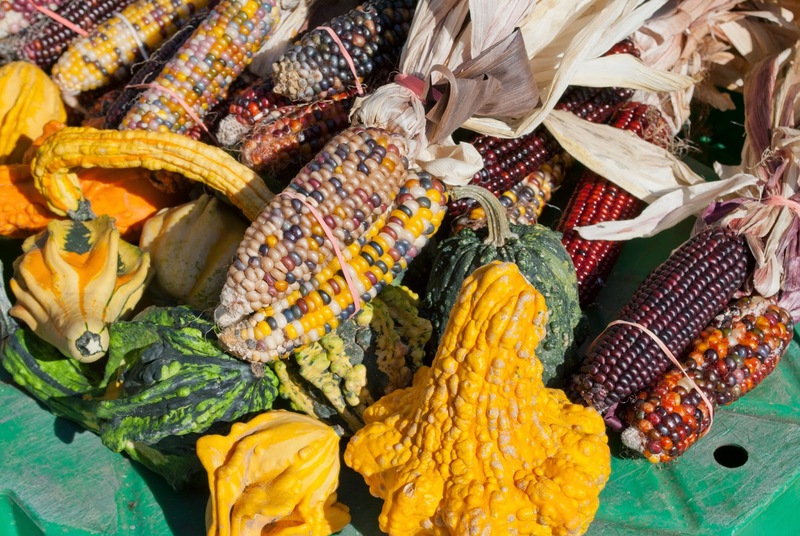 Wishing you all another year filled with things to be thankful for! 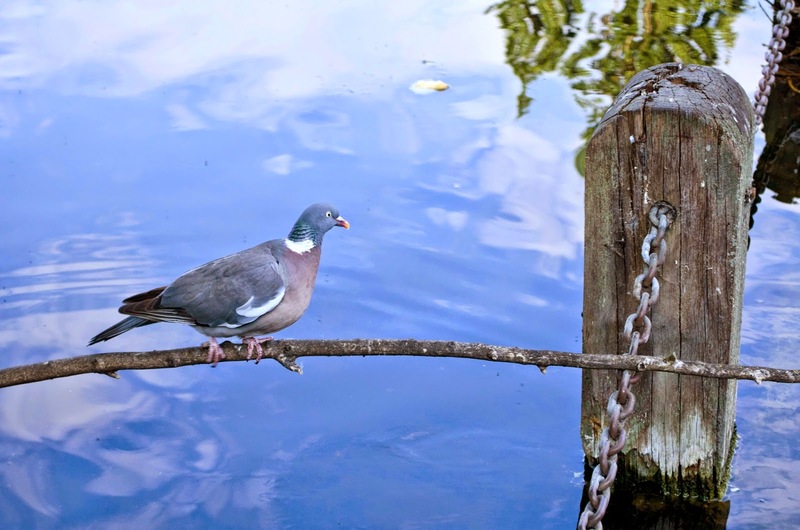 I walked around my Brooklyn neighborhood today, scouting for handsome pigeons. 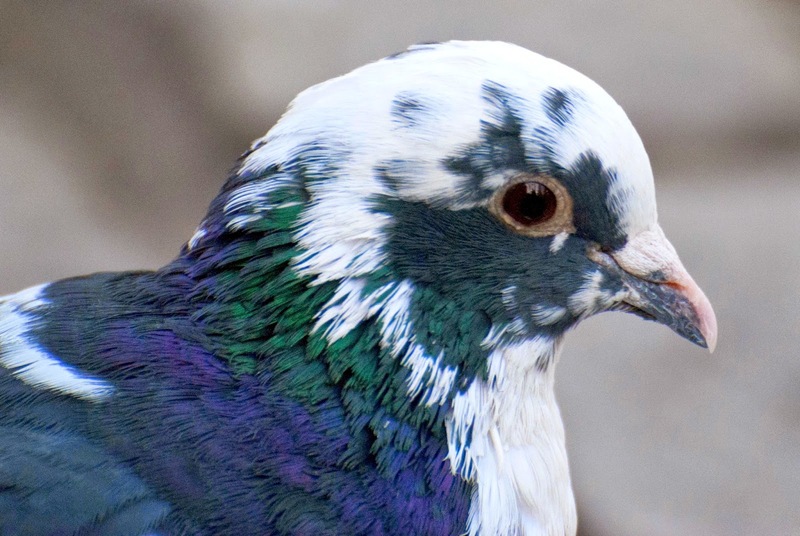 I am partial to the piebald ones that have patches of iridescence. 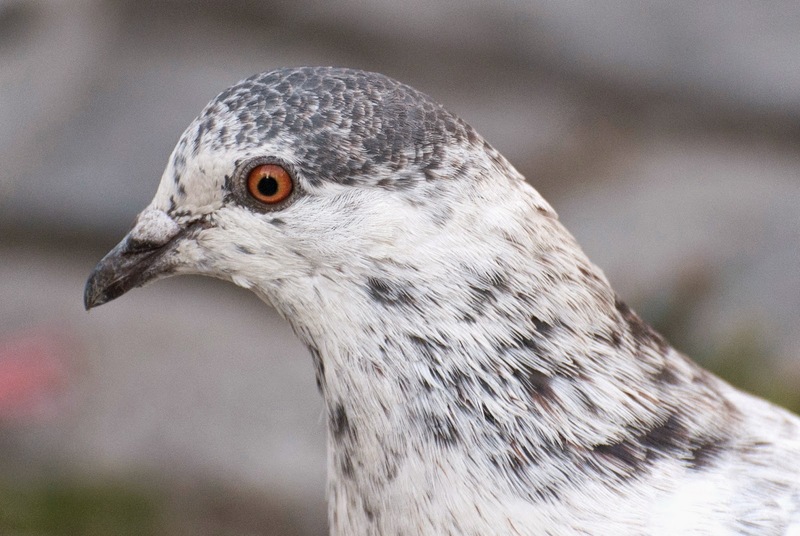 Although pigeons rarely seem to stay still for long (at least when I am trying to photograph them), some paused long enough for these portraits. Click to enlarge. Of their necks in an instant, and are gone. p.s. 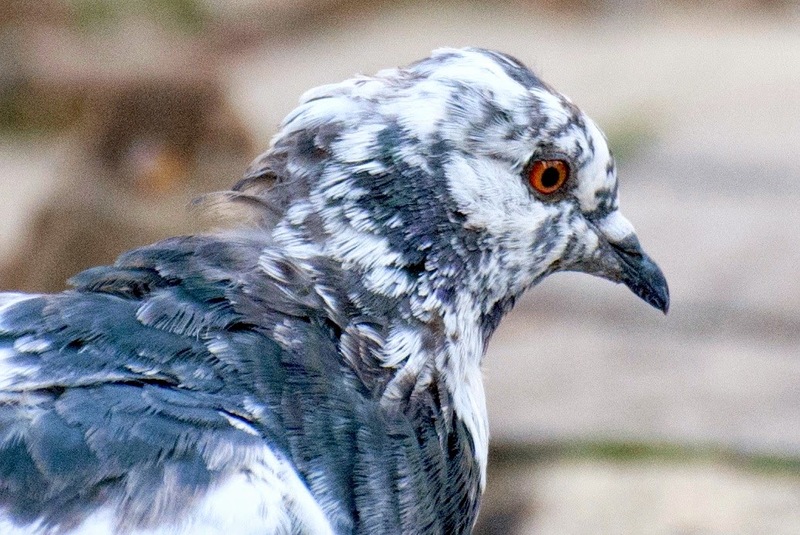 Stay tuned for the upcoming gallery of Brooklyn's most beautiful pigeons. See the holes in the rose petals? That little brown beetle on the bud in the upper right is responsible. It's an adult rose weevil, about 1/4 of an inch long. Click to enlarge. 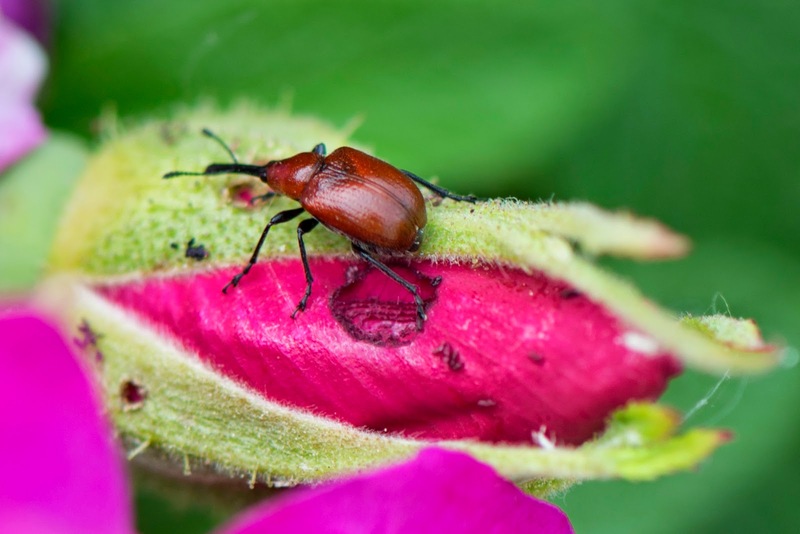 Rose weevils have long beaks with chewing mouthparts at the end. 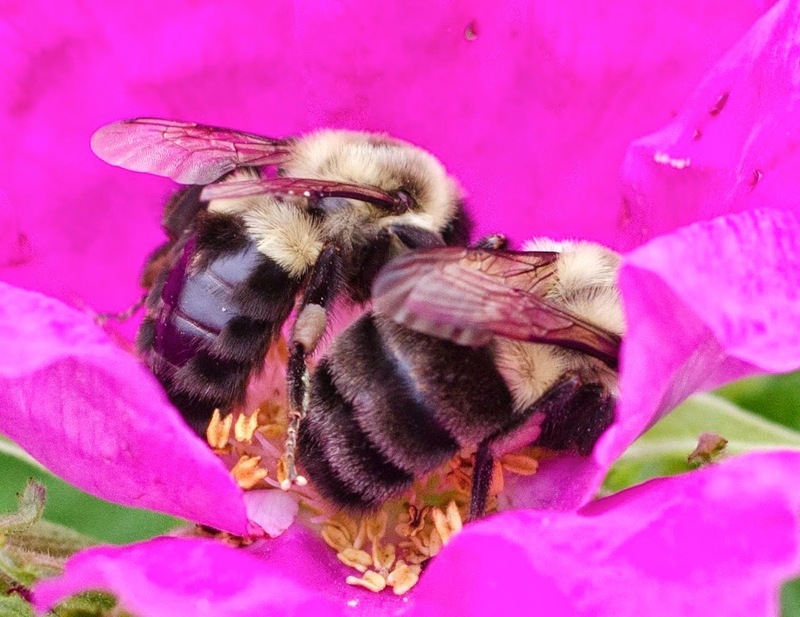 They poke them into rosebuds and munch away, making holes. When the buds unfold, the damaged layers unfurl. 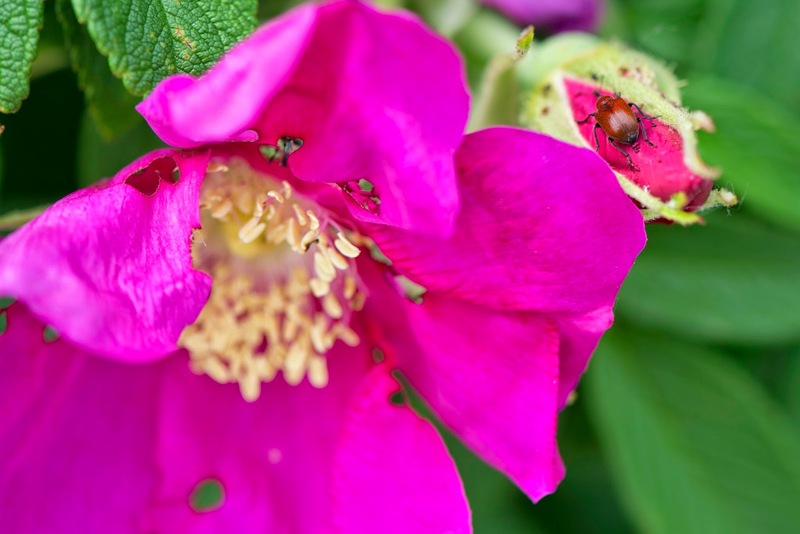 Rose weevils lay eggs in some of the holes they drill in buds. The eggs hatch into wormlike larvae that feed inside the bud and can weaken its attachment to the stem, so many infested buds fall to the ground. The larvae come out of the buds, burrow into the ground, and spend the winter there. They eventually pupate and emerge the following year, in time to eat more roses. A close-up of a rose weevil walking on a rosebud with a big hole in it. Hmm...wonder how that happened? It reminds me of this poem by William Blake. There is a lot of activity on milkweed plants this time of year. 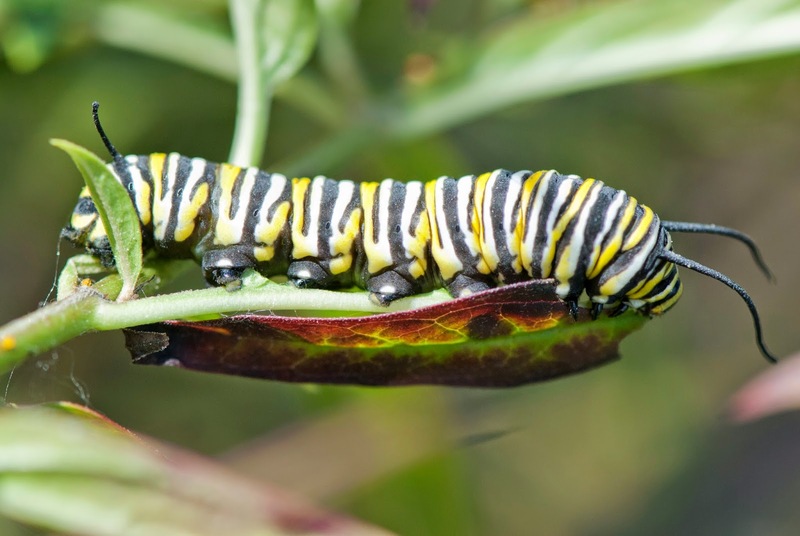 I wrote a blog about some of the members of the milkweed community in October of 2011. You can see that blog by clicking here. Today I saw this late instar monarch caterpillar. Its head is on the right. It was eating voraciously, bulking up for its pupal stage, which will come soon. It will pupate for about two weeks and then emerge as a butterfly to begin its long migration south. Click to enlarge. 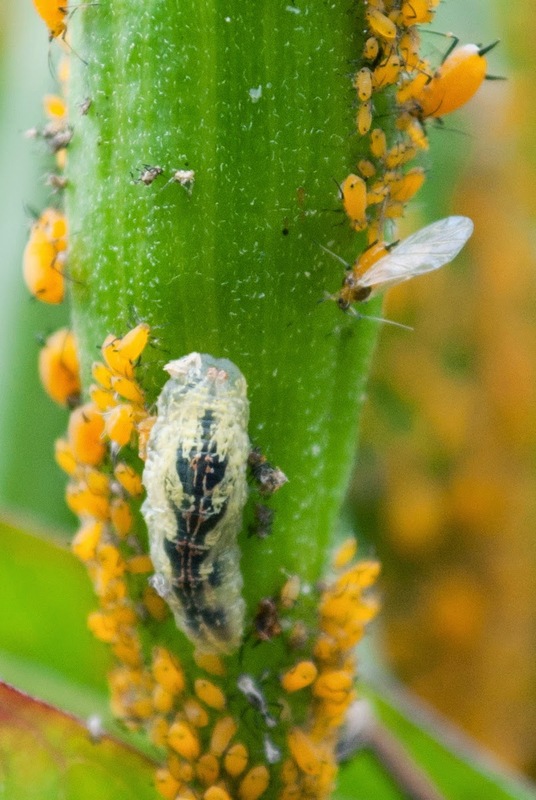 The plants were covered with oleander aphids like this one. A few of the aphids had wings. 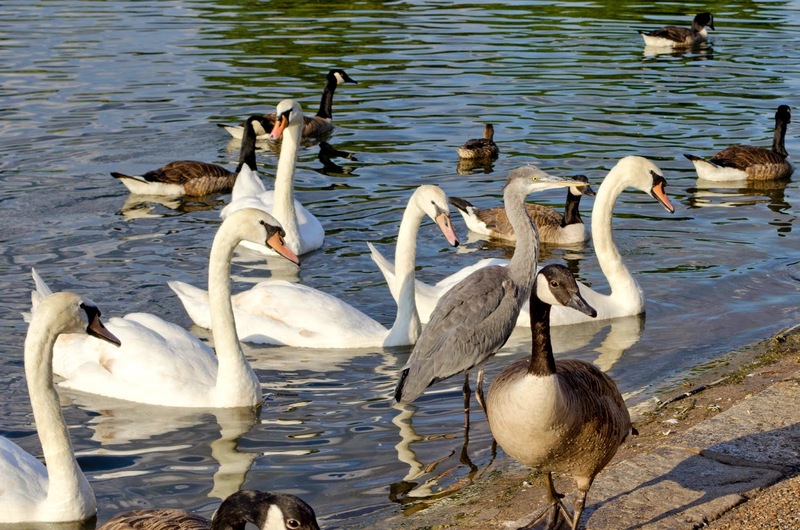 There is one in the upper right of this photo; winged individuals can disperse to nearby stems and pods to establish new populations. 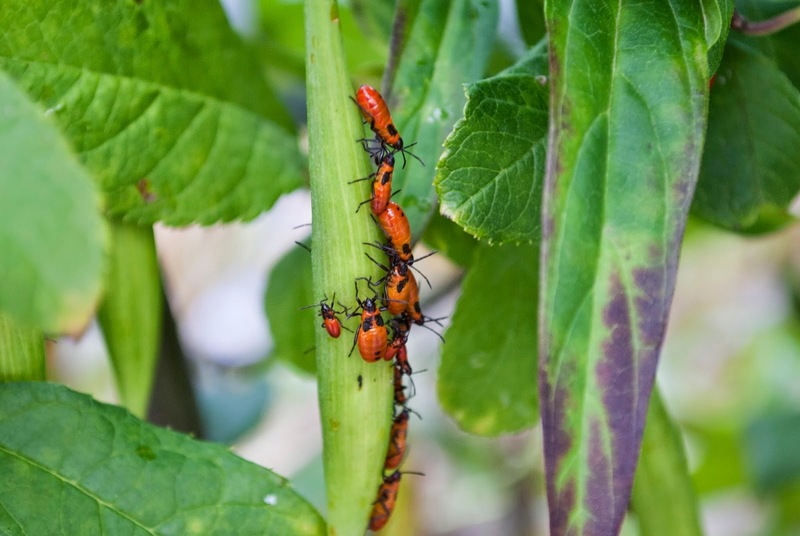 Click to enlarge the photo and you will see that there is a caterpillar-like organism among the aphids. It is the larva of a syrphid fly; it will grow up to become a hover fly (also called flower fly). 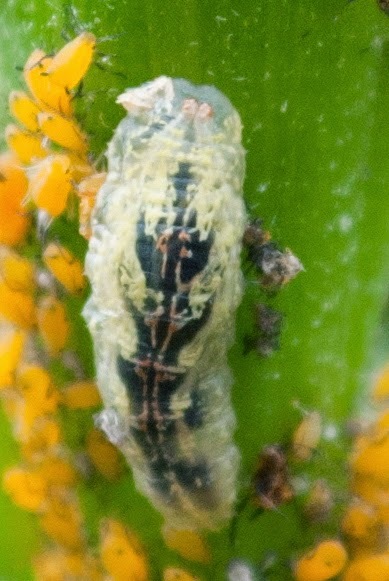 In its larval stage it eats aphids. No shortage of those around here. A closer look at the fly larva. It is easy to mistake for a caterpillar, or even a plant part. Stealthy! 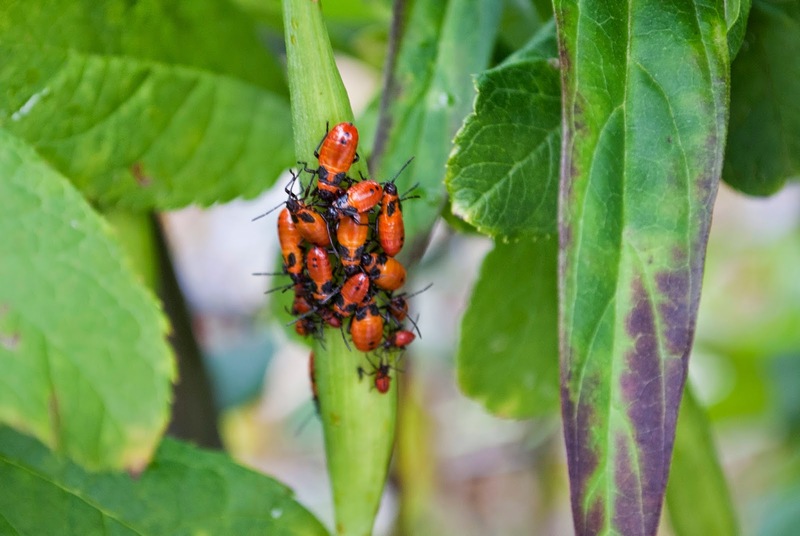 As I was clicking pictures of this cluster of milkweed bug nymphs, I got a surprising message from them -- they knew they were being watched and they did not like it. See the picture below. They all ran around to the other side. The angel moth caterpillar. Click to enlarge. I had uncommonly good luck with caterpillars during my recent trip to Kentucky. This is the angel moth caterpillar, Olceclostera angelica, a member of the Bombycidae family of silkworm moths. Angel moth caterpillars usually feed on lilac or ash. This one was on a wooden fence post, probably after falling from a host plant. I saw it near the historic entrance to Mammoth Cave in Mammoth Cave National Park. 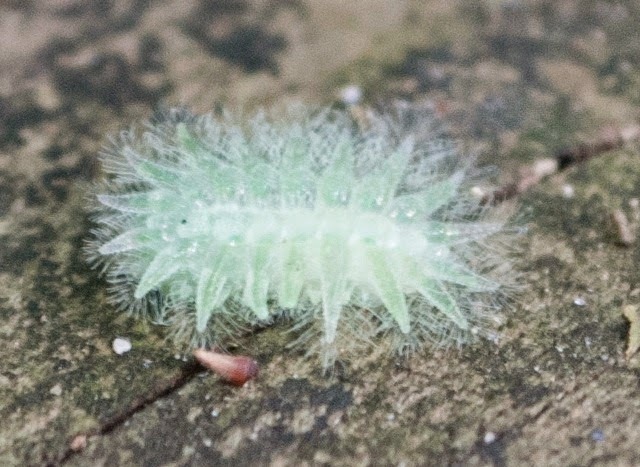 It is an uncommon caterpillar, not often seen, and, like the spun glass caterpillar I saw nearby and wrote about recently (click here to see the story) -- I had never seen one before. 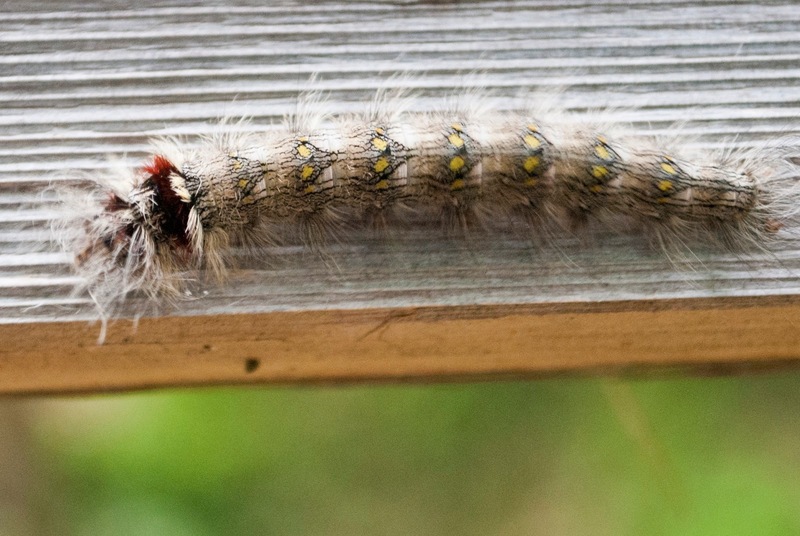 The longhaired angel moth caterpillar grows up to be a handsome furry-legged moth with a glittery abdomen and silver-grey scallop-edged wings that made the scientist who named it think of angels. Click here to see a photo of the moth. The Chinese mantis, Tenedera sinensis. Click to enlarge. The Chinese mantis is remarkably easy to overlook for an insect that is five inches long. This one was blending in among leaves and flowers along a fence on Pier 1 in Brooklyn Bridge Park. 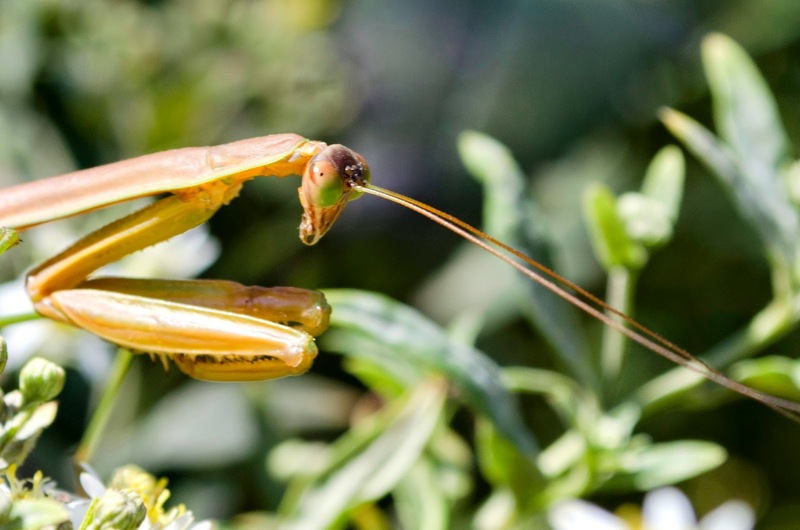 The mantis is a predator that sits quietly waiting until its (mainly) insect prey is within striking distance; prey can be almost any kind of fly, bee, spider, moth, or similar thing. It quickly grabs the victim with its spiked forelegs, impaling and holding it, and then eats with a mouth that cuts and tears. The Chinese mantis is native to Asia. 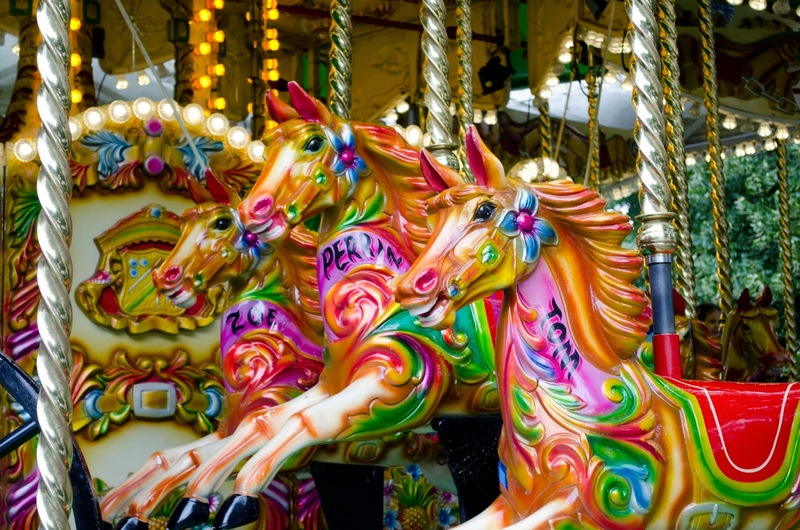 It was accidentally introduced to the United States in the late 1800s and spread. 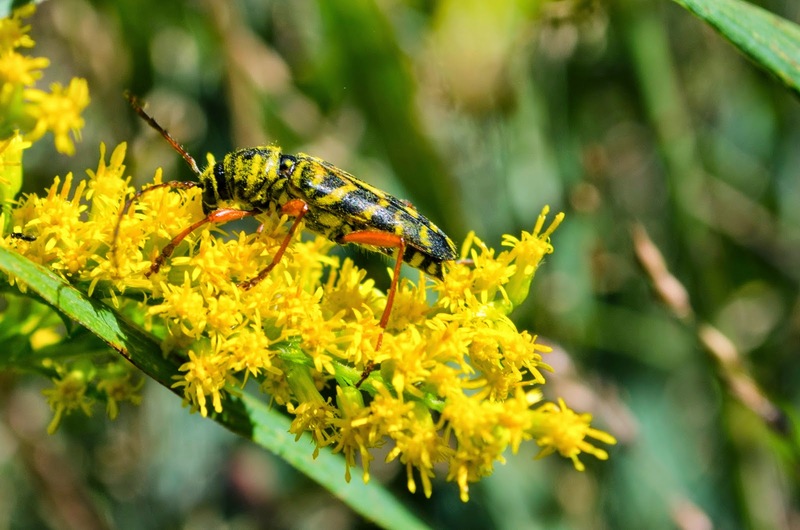 Gardeners now deliberately release them for biological control of plant pests and Chinese mantises are kept as pets. They consequently can be found in the wild throughout the the country. This is one of a few kind of mantises that you might encounter. I wrote previously about a Carolina mantis (Stagmomantis carolina) that I also saw in Brooklyn Bridge Park -- in the same spot! 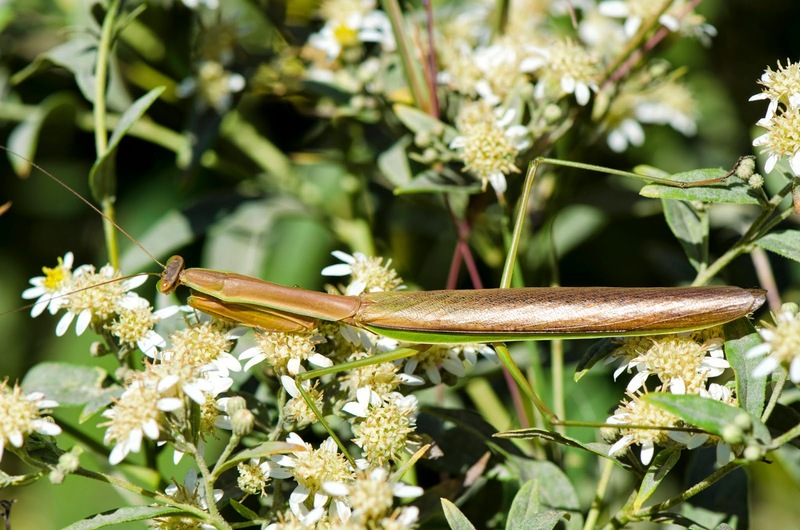 You can see that blog and compare the two mantises by clicking on this sentence. 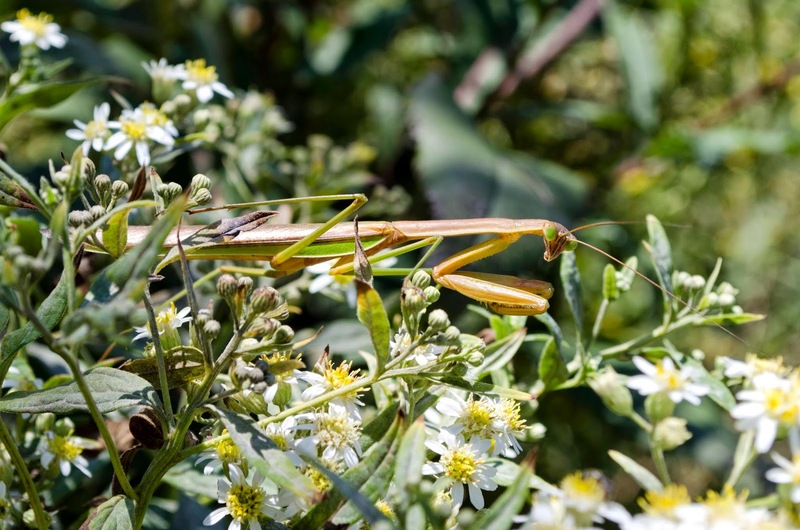 It seems that Brooklyn Bridge Park is a good place to find mantises. I'll bet it is because of the variety of tasty prey that results from the thoughtfully chosen plantings. 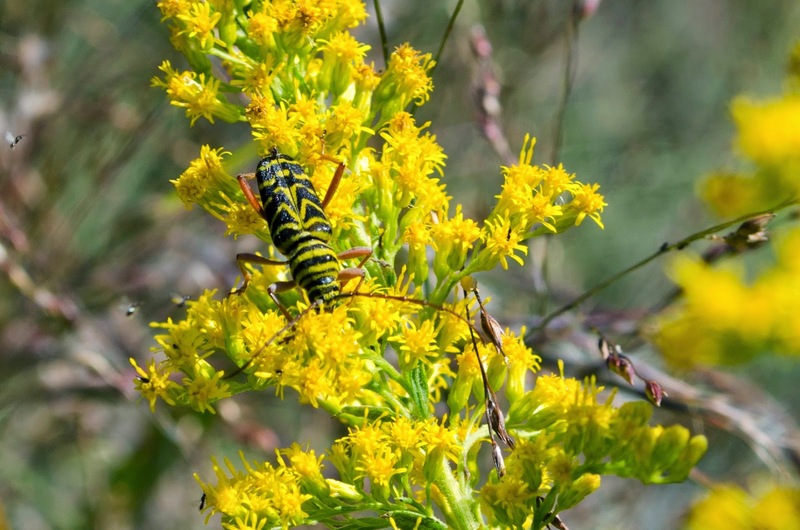 Look for mantises near blooming flowers by the Pier 1 section of fence that borders the wide gravel road on the eastern side of the park. 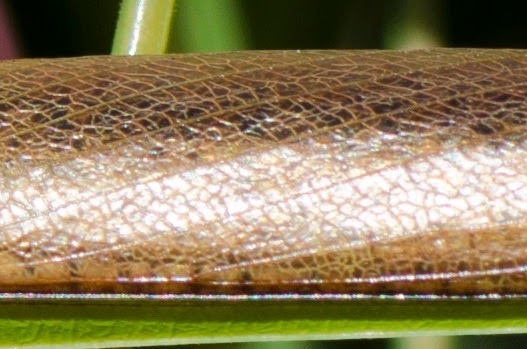 The surface of the mantis' wing case looks deceptively like a dry leaf. If you don't know it's there it is easy to overlook. But when you get up close, you'll find it is watching you.